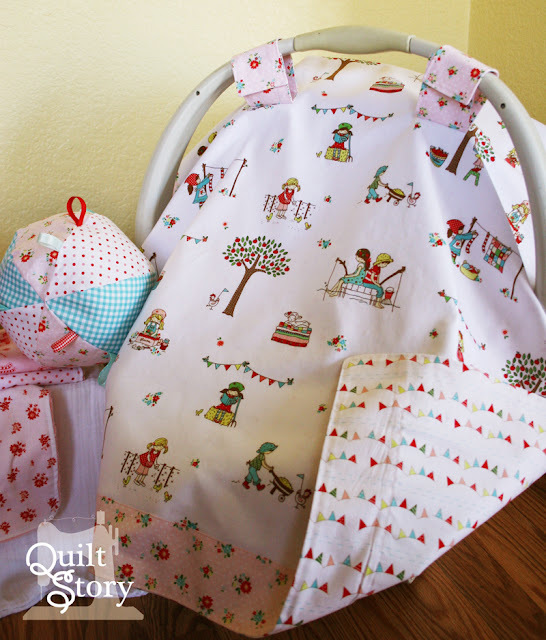 Quilt Story: Fabric Tuesday & Winner! Oh my, what can I say...I love their kids' fabrics as I make lots of children's quilts, and their dots & stripes, and their duos/trios...fun, fun place to visit! Fabric Tuesday! And selfishly I'm sharing again! 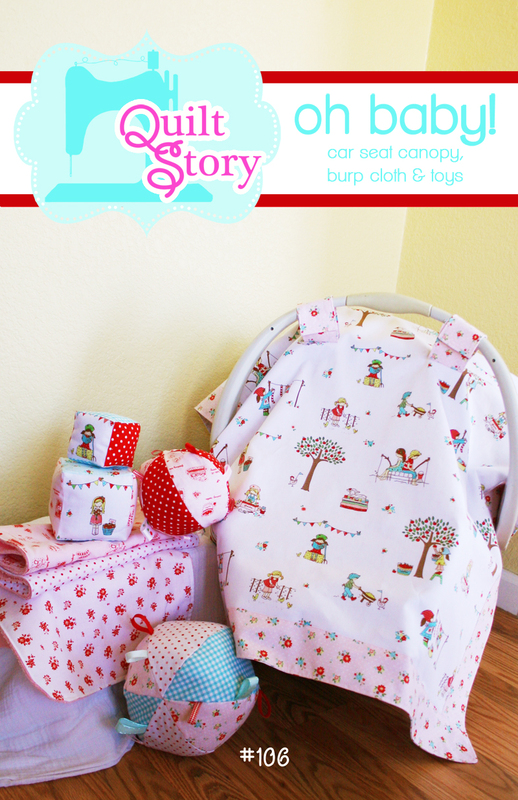 I've remade our popular Oh Baby! pattern in one of Riley Blake's newest lines, oh goodness. It is so so so sweet, I'm in love! 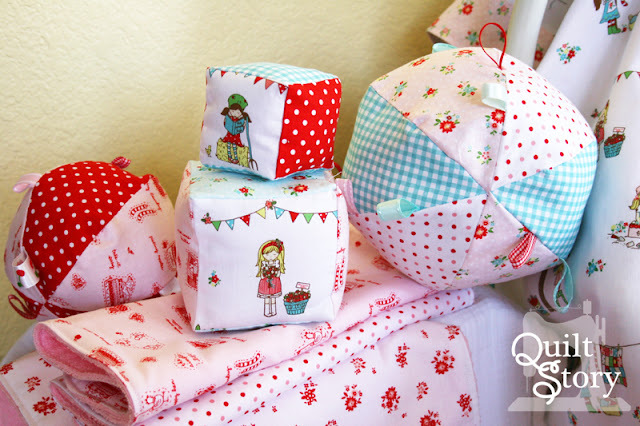 This fabric line is just now available, it's called The Simple Life by tasha noel for Riley Blake designs. I haven't seen it in my LQS quite yet. There's a blue, pink and white colorway. The main print with the sheep on the quilts, girls reading a book, picking from the apple tree...swooning!! I knew I would love that for sure, but the small vintage flowers?! (Seen here on the car seat canopy trim and large ball) I am stocking up, I already used what I had. They are the daintiest prettiest flowers. Sometimes when I make these toys I add tags, no tags, sometimes I just stuff them and sometimes I add these cat toys. Have you seen that before? It's genius whoever thought of it. It makes the perfect little baby noises. I added the pink floral border on this canopy and used it for the straps as well. On the inside lining I used the cute bunting print. I like using just cotton prints on the canopy because it just seems so breathable and light. Especially in Arizona where our winters are many people's summers!! Oh Baby! pattern can be found in our shop. Let's see what projects you've been up to! Remember you can link up multiple times, it doesn't have to be this week just "recent" and it only has to include fabric! Love how your whole project turned out, but especially the blocks and taggy balls. That is such a gorgeous set - brilliant job well done! I've had my eye on that new fabric line! Can't wait to get my hands on it soon!! 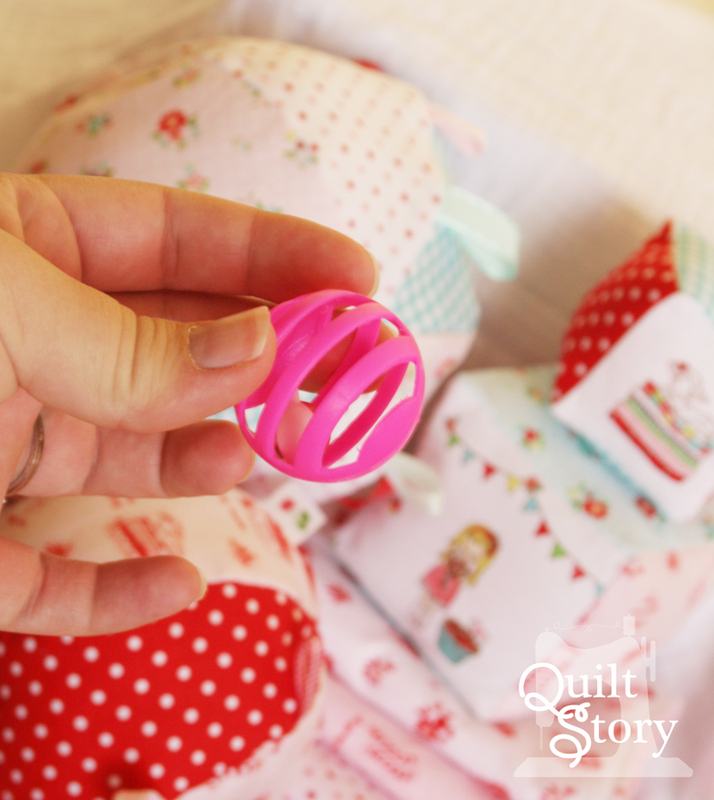 What a gorgeous set of baby gifts! I need to keep these in mind for the next baby shower. Very sweet fabric in your pattern. I am new to Fabric Tuesday and looking forward to checking out some of the links posted. OH MY---I had to read this 3 times before I believed it was me that won! Thanks so much; I never win anything! I sincerely appreciate it; can't wait to "play" with the fabric--it's so delicious. THANKS AGAIN! Sweet Ruffles a Quilt Tutorial from Meg! Foxy Geese and Fabric Tuesday!